This is not true. I have a team of foragers, tried both zones for over an hour each and no Brick of Immaculate Steel got foraged. This item isn't tagged as being foraged. When an item is foraged you'll see at the top of the page that it is foraged. The zone description you quoted shares where you can find the item if it is dropped with where you can possibly forage it, if it were foraged. 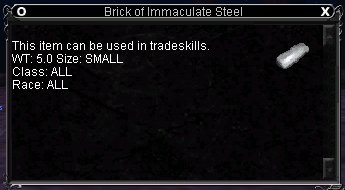 Is that equal that Brick of Immaculate Steel?